Hi everyone. It's Tracey here to share a tag featuring the Julie Nutting 4" Naughty or Nice Christmas doll. Yes, you know me all too well. I went with a nice version. These girls are so fun to work with and as you've seen in our design team examples can be used in so many different ways!! Here you can see a few more details on my doll. Her dress and hair were colored with Copic Markers, then her body and shoes painted. The fluffy edges on her dress, hat and shoes were created with white Liquid Applique. This is a fun product that you apply, allow to dry, then when heat is applied, it puffs up. To add sparkle, I brushed the puffed areas with Designer Dries Clear glue and sprinkled with Fairy Dust Glitter by Donna Salazar. It's not too visible in the photos, but I brushed Heidi Swapp Cherry Color Shine over the red for a touch of soft shimmer. This wrinkled bow is a great way to finish off a tag. I have a tutorial on creating Grungy Wrinkled Ribbon from rayon seam binding here. 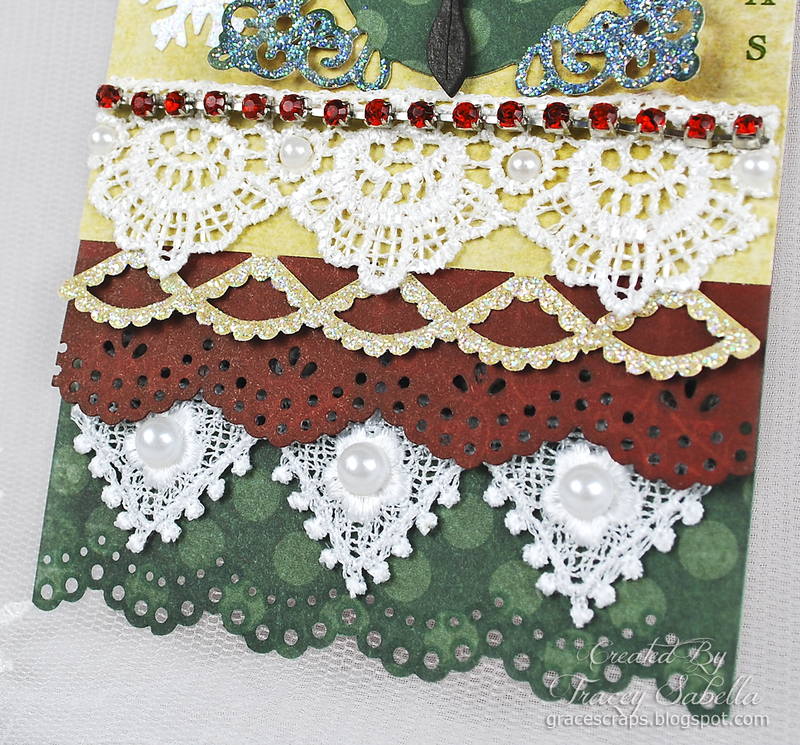 I die cut the green layer using a Spellbinders die and added sparkle to the flourish corners with more Fairy Dust Glitter. 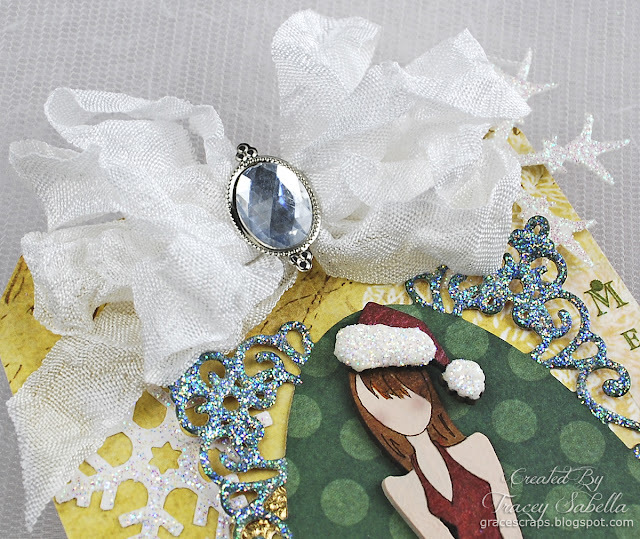 The white snowflake border was brushed with Stickles. Lots of shimmer on this tag! 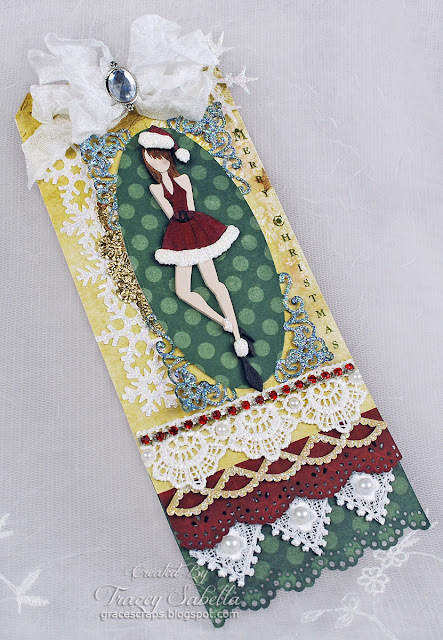 The bottom was layered with lacy punched Christmas paper, gorgeous white lace embellished with pearls, a strip of red rhinestones and more Fairy Dust Glitter on the punched yellow border. The Merry Christmas sentiment was printed on a transparency sheet. I also tucked in a snippet of gold doily and a punched snowflake heat embossed with glitter/holographic embossing powder. for a complete list of products used. 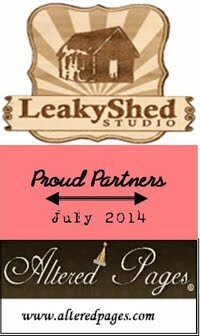 project by Debbie Sherman featuring Leaky Shed Studio Chipboard. This is gorgeous!! I loveeeeeeee her dress, the glitter and metal embellishment!!!! So pretty Tracey! Love all that glitter! I am in love with this.. thank goodness for close ups I would have missed the details!!! Gorgeous! !